As home schoolers we have kind of a slightly different view of the beginning of the school year. First, there really is never aq beginning or ending because we are always doing at least some schooling all year round, but there is a ramp up in September and a ramp down sometime in May. As with everyone else the beginning of the school year can mean some adjustment. For example, some of our summer activities are still going on. There is still work to do on the Farm, and canning things like that. We are all in training for our Home school 5k that has been being neglected most of the summer so some days schooling get pushed aside so that friends can come over and do training too. In cases like that, so that we don’t fall behind like we have in the past, we have some odd situations. Which brings me to the topic of this post. Some times Home schooling is a bit of an odd beast. One of the greatest parts of it is that you really can do it anywhere. Sometimes that anywhere can be the parking lot at the strip mall outside the Dojo while we wait for karate Lessons to begin. 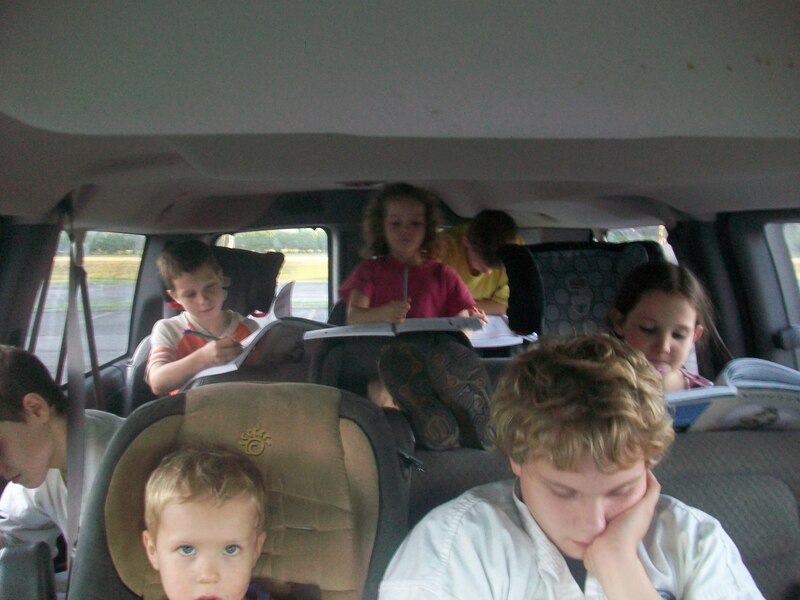 I guess you would call this Van Schooling. As a side note, once it got too dark in the van to read I did break out the laptop and the kids were watching a movie. Star Trek of course (I know dad is so mean) a couple of the younger ones were not really interested and so were sitting in the front seats. A lady pulls into the spot next to us and gets all concerned that the kids were in the van alone. I was there. I was slouched in one of the back seats holding the laptop up so they could see. but it caused a bit of a stir as the bar owner then came out to check on the kids as well. Thanks for being vigilant folks. The kids all thought it was kind of funny. Especially since when the lady started looking in the van at the kids they all said, “Dad there is some lady looking in the van” and I waved at her. Oh well. Previous Our Brother Joe is Dead.